The Panasonic T9 is a low budget smartphone that offers just the right amount of functionality with its features. 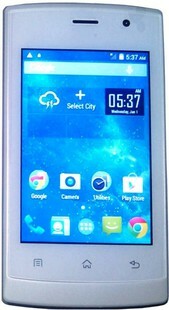 The Panasonic T9 price is INR. 2400. The key features of the Panasonic T9 are its good appearance, durable battery, and sufficient storage. Coming to the Panasonic T9 specifications, it has a 3.5-inch display alongside a capacitive touchscreen. The device comes with a storage of 4GB which you can extend with a microSD card up to 32GB. The RAM of the phone is 512MB and is paired with a Dual-core processor that can process data at a 1.3GHz frequency. The Android on the phone is KitKat v4.4. The device provides 3G connectivity, Bluetooth, GPS, and USB. A 2 MegaPixels primary camera and 0.3 MegaPixel secondary camera is fitted in the device. As mentioned above, the phone has a battery of 1300mAh capacity. As far as the design is concerned, the phone comes with a small body that’s 10mm thick. The shape of the phone is designed for a better grip. To conclude, the Panasonic T9 is surely a low-cost device. The major reasons to buy this phone is its huge storage space and fast performance. However, if you are looking for a good camera on a phone, this device is not advisable. Panasonic T9 full specs and reviews as of Apr 2019. Buy it here!